The Basket Puzzle quilt block is made of simple shapes -- only the square and half square triangle patches are used. 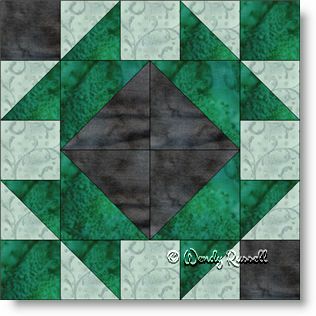 This quilt block can be used as a lesson for beginner quilters and also for a lesson on colour value. To make a really effective block, you need to use fabrics of light, medium and dark values. The quilt block is technically a five patch as it has five distinct rows. However, the construction of this quilt block is done in the form of a nine patch. The sample quilts illustrated show both a straight setting and an on point setting for the blocks. Let your own imagination take hold and create a stunning quilt with your special colours.